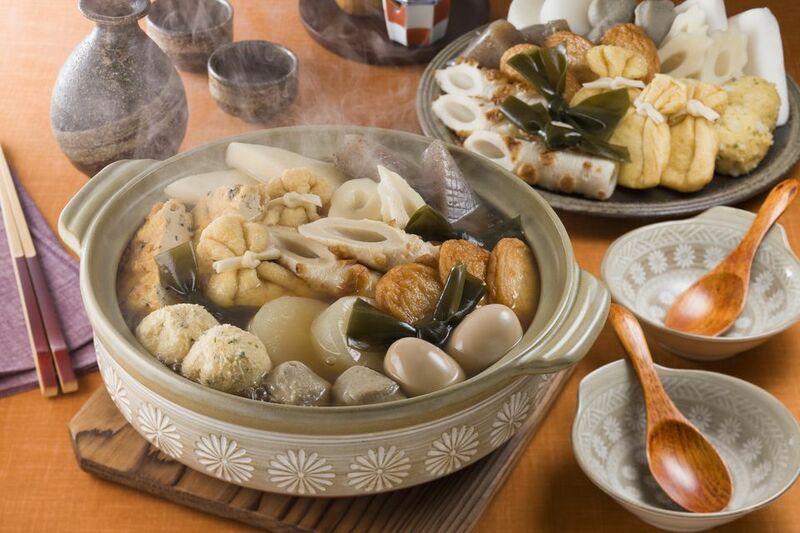 Oden is a Japanese hot pot dish in which ingredients are slowly simmered in a soy sauce based soup. It's typically considered a winter dish in Japan and usually appears around September or October. Warm, filling and tasty, there are all kinds of oden experiences to be had. The method described in this recipe is just one way of making Oden. You can vary certain ingredients, but others like daikon radish, boiled eggs, konnyaku, fish cakes, and dashi broth, are common in most versions of the dish, which in Japan varies by region. You may use Oden seasoning sold at Asian stores instead of using sake, soy sauce, and sugar. First, start by making the dashi stock: In a large pot, let the musubi-kombu warm along with the water on the stove. Remove the pan from the heat right as it reaches a boil—you don’t want to let the mixture boil as the kombu can leave a bitter flavor and create a slick texture—and remove the musubi-kombu from the broth and discard. Set aside. Next, peel the daikon radish and cut into 3/4-inch thick rounds. Set aside. Next, peel the potatoes and cut in half. Set aside. Boil your eggs and then peel them. Set aside. Cut the konnyaku and atsuage into large triangles. Leave the 4 cups of dashi soup stock you made in the beginning in the large pot or place in a donabe pot. Place all the ingredients in the pot. Bring to a boil and turn down the heat to low and simmer for 40 to 60 minutes. Add more dashi soup stock and soy sauce as needed.